OK. I know what you're thinking, "aren't you finished with that gallery wall yet?" And believe me, I feel ya. But when you figure I haven't really paid anything for all the "art" pieces I have finished, I guess it's not too bad. 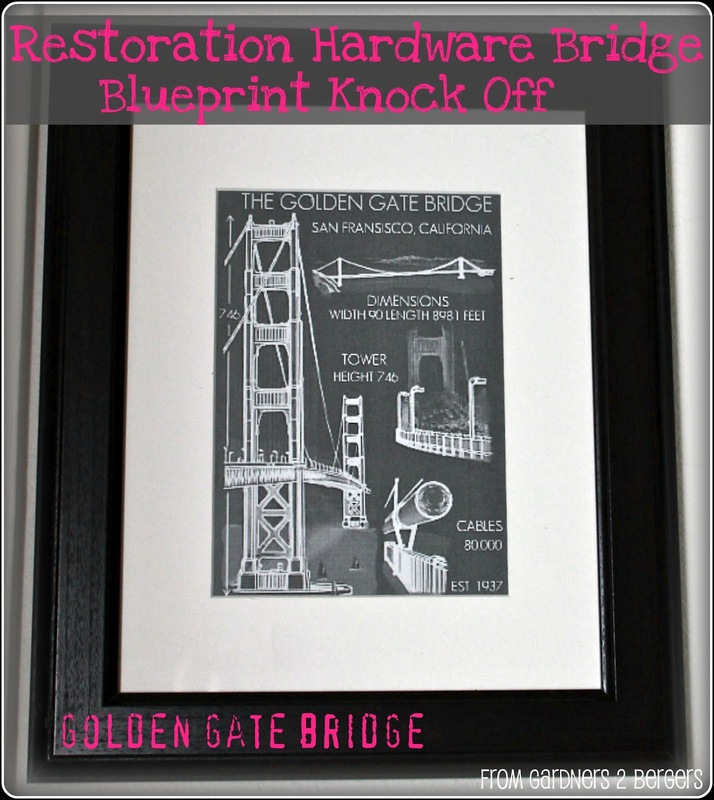 Today's quikie project, Restoration Hardware inspired blueprint art. Have you guys seen their massive piece of blueprint art. It measures something like 5 ft long! Anyhow, here's a miniature version for my little space. This project was totally painless. 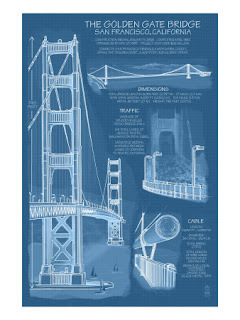 First I found some blueprints or schematic drawings online. I was looking specifically for images of bridges. I looked for bridges from places we like to go, specifically Cape Cod, Brooklyn and San Francisco. On the left is an example of what they looked like pre-photo editing. I uploaded them to Picnik, then to be able to change both colors, you click on "Create" then you want to click on "Effects." You're looking for "Duo-Tone;" once you find it you're able to select the colors you want to contrast. I picked stark white and matched the gray to the Restoration Hardware image in the photo. That got me to this image on the right. I decided to edit out the smaller the words and replace them with the bridge's actual measurements, but in a larger font. I figured this would be pretty "blueprinty." Here's the print, framed and on the wall. Here's the last close up. One of my favorite places, San Fran. 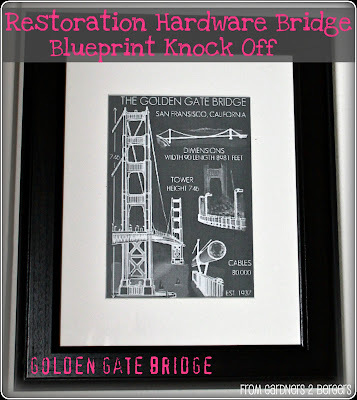 Thanks for checking out the "Mini Me" version to Restoration Hardware's Dr. Evil 5 foot gorgeousness! UPDATE: My SHOP opens 4/2/12. So swing back by if you'd rather just buy one of these!! Looking for places to link up your projects? Check out my Party Page! Love watching the wall art grow! Also love all your wall art projects because they look expensive! I'm thinking about doing this with the option of getting the blueprint copy from Staples. I think for a 2'x3' it used to be $3 (because it's black and white). Thanks for the hint about redoing the type. Again, love the ideas - already did the eye chart one. SO SO COOL! I love it! 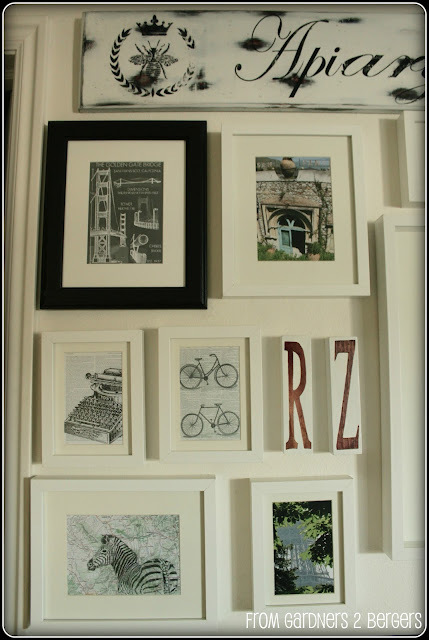 Love your gallery wall art! I saw your post over at "Tales from Bloggeritaville". Your blueprint looks fabulous! I'm very low tech but I can use the "effects" button over on Piknik. Did you "erase" the text on the original picture before you took it to Piknik? I know how to add text over there but not erase text. Thanks. Coming along so nicely! Love the blueprints!! Becca you did a great job on these!! I love them! I featured you today in my Friday I'm In Love favorites. Neat idea! I really love the whole gallery wall. What a great idea. Your whole wall looks amazing! hi Becca - I really like it! Great addition to your visually interesting collection! 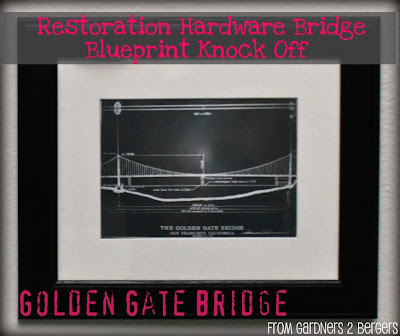 I've been looking for blueprint images and have found some interesting historical society archival sites that have interesting blueprints. I haven't pursued it yet (time management - argh!) but was going to try to get a large print at one of the local engineering firms that offer large scale printing services. I LOVE that blueprint art work! What a fabulous idea! This is so cool! I love it, I have to try it out! So far, I have to try out ALL your projects! Love 'em. Love it! What an interesting gallery! i love this! coming by from Today's Creative Blog. these are gorgeous... i'd love to do something similar for my ugly bedroom walls. I saw those print in the RH catalog. You did a great job replicating those. 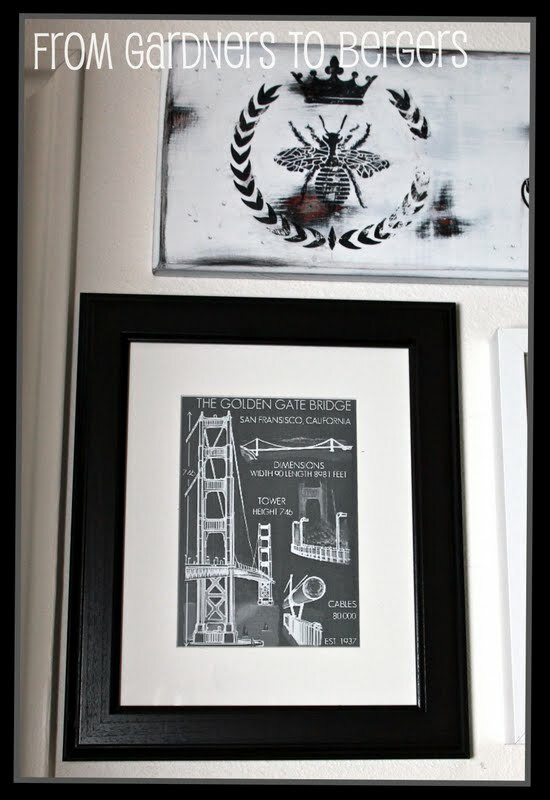 I love the bridge print and your whole wall! It's looking GORGEOUS and so unique! Such a great idea! I'm going to forward this one to my sister. Would be perfect in her house. That wall be the most fantastic thing ever when you are done with it! Love everything you have done so far and it's been interesting to see it come together. Thanks so much for linking up again to The Creative Spark and showing us your progress! Have a great week! Well, wow! Are those from real blueprints? They're really quite interesting to look at. 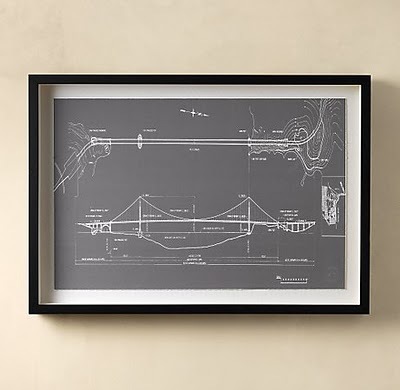 Your pics of the blueprints for bridges have a certain charm. Now that is unique art! This is such a great idea! I love the industrial look of blueprints and your method for doing them on the cheap is great! As your newest follower I would love it if you linked up to T.G.I.F. ( Thank God I'm Finished!) Link Party happening RIGHT NOW at RummageLiving! It looks fabulous!!! I'm going to have to give that a try! This is fantastic!! 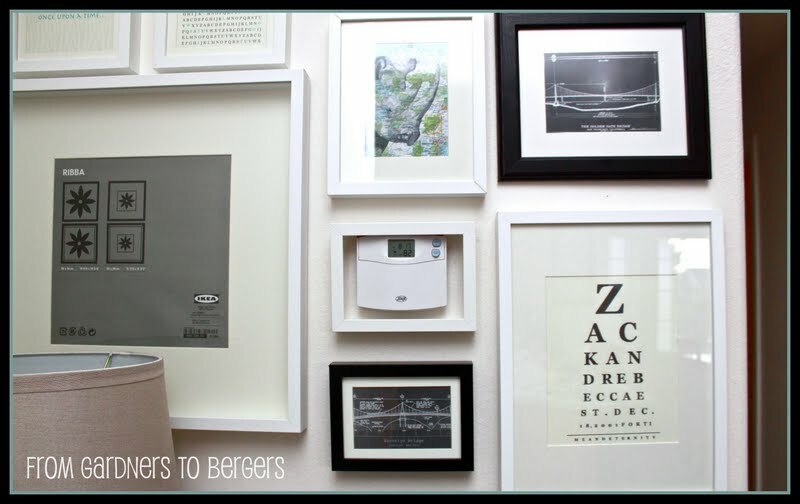 Your gallery wall is terrific!! I love how you did this print. I've been trying to figure out how to make these... Thanks so much for sharing, they came out beautifully! PINNED! This is fantastic! Would you mind if I featured you on my blog? 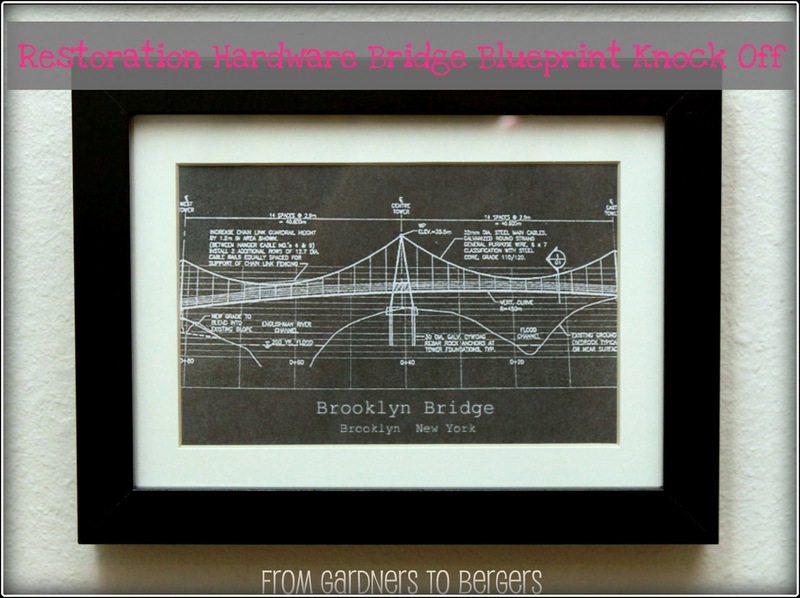 Your Brooklyn Bridge print is awesome. I've been searching for a blueprint of the Brooklyn Bridge to upload to Picnik but cannot find one that remotely looks like yours. Will you please forward the internet site? Thank you! Thanks so much for your comment and your interest in my project!! I will happily forward you my copy of the bridge- but I don't have your email. If you send it to me I will shoot it over to ya!! Thank you - I am SO excited about this post!! Ideas are running through my head! I love it. hi there. great project. just wondering what type of paper you printed your image out on and if you have any suggestions on how to do something like this in a larger scale format. thank you! I love this project and idea, so awsome, thanks for this post. Oooo, I really like this one! 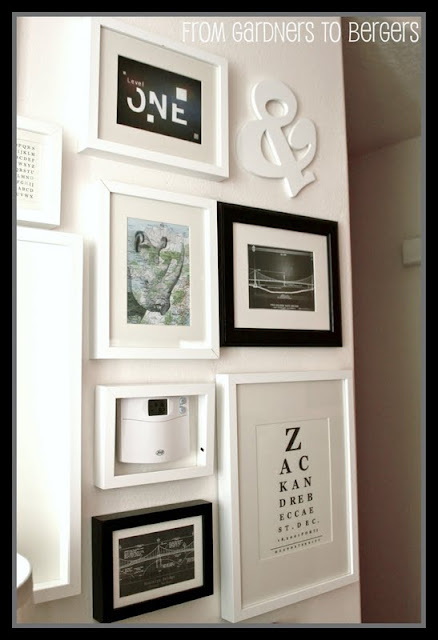 Looks like you still have some gallery wall frames to fill, and that means we'll be getting more awesome DIY art ideas from you! Love how this turned out I'm featuring it on scrappy saturdays tomorrow! I've learn SO MUCH from your website! Your blog is awesome! full with beautiful ideas. I've been spending so much time browsing all your post. Thank you so much. I'm trying to search online for blueprints, but they all kinda too low res. It will be great if you would share the website link for blueprints that you used for. thanks again. oops I forgot to leave my email address: jellybean9000@gmail.com Thank you! It looks great. Very clever to change up the RH picture in Picnik. Doesn't it just make you want to cry that they are closing Picnik. 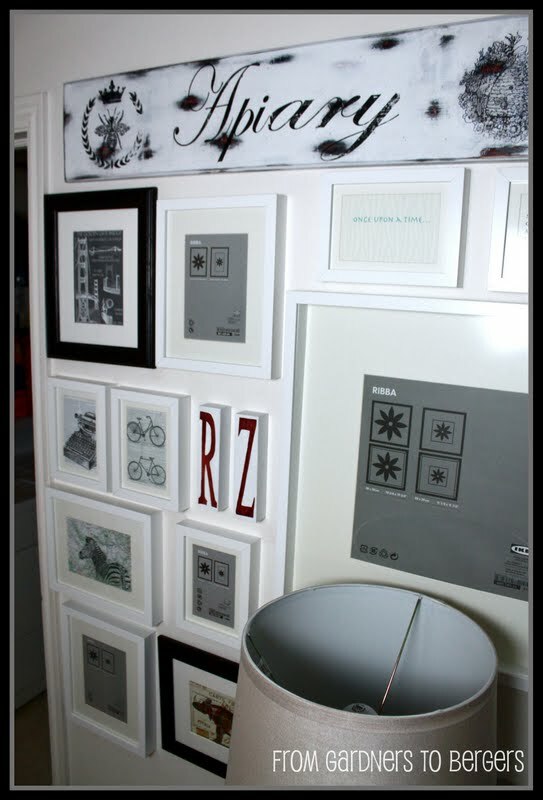 Your gallery wall is looking great, and I love this blueprint art (my husband would really dig this too)! Can't wait to give this a try. Thanks for linking up. Every single project of yours is fabulou! This is no exception! You are one incredibly talented lady! Came here from Tipjunkie. I've planning to make a RH blue print knock off for some time. Thank you for the tutorial. Hello, just wanted to say that I have been stalking your blog for days and I am still on the galley wall! Ha! 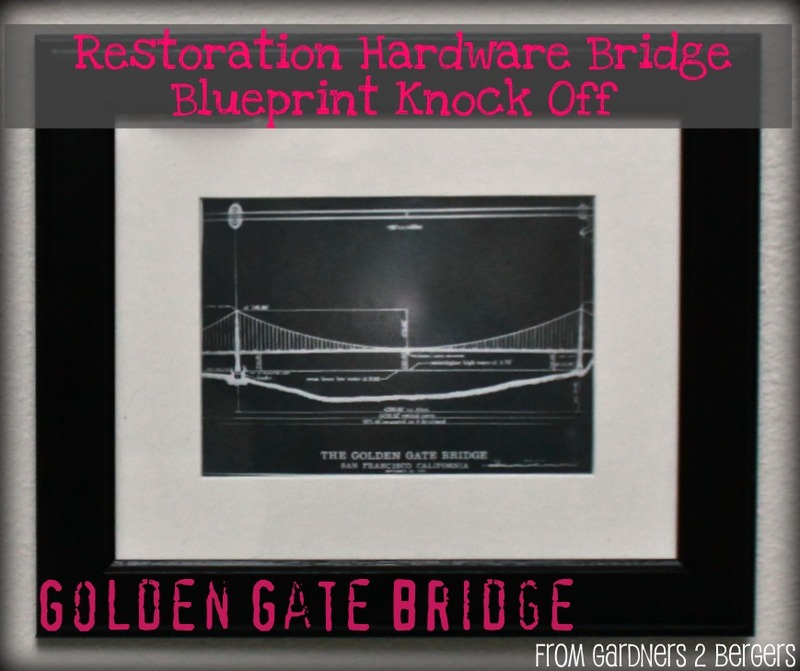 I have been searching for awesome blueprints for Cape Cod bridges! haven't found anything even close to yours! would you be willing to share?